Cardiologists are doctors who have special training in preventing and treating heart diseases. According to the Centers for Disease Control and Prevention, heart attacks are a leading cause of death for both men and women in the United States. Many patients suffer and die from heart problems that could have been avoided or would not have been fatal with the appropriate treatment. Not all cardiologist errors qualify as medical malpractice, but it is important to consult a Chicago cardiology malpractice lawyer to find out if there was malpractice in your particular case. If you believe you or a loved one was a victim of negligence by a cardiologist, the medical malpractice lawyers at Moll Law Group are available to make a claim to recover compensation. In order to recover damages for cardiology malpractice, you need to establish the standard of care for the heart or blood vessel condition at issue. The standard of care may vary depending on the patient's medical history, age, and gender. For example, a cardiologist may use a different differential diagnosis on an otherwise healthy 15-year-old girl than he or she would use on a 70-year-old man who is a smoker. You also need to establish the cardiologist's negligent breach of the standard of care, a causal link connecting the breach to your injuries or illness, and actual damages. Causation is a crucial element, and you need to establish that more likely than not, the defendant's negligence caused your injury. In almost every cardiology malpractice case, it is necessary to retain experts to testify on the breach of care and causation. A cardiology malpractice attorney at our Chicago firm can assist you with this process. In Illinois, a cardiologist can testify as an expert if his or her experience and qualifications provide knowledge and expertise that is not shared by laypeople, and the cardiologist's testimony will help the trier of fact (often a jury) make conclusions about the evidence. 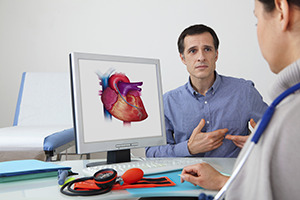 Generally, cardiology malpractice experts are board-certified cardiologists who are familiar with the treatments and methods used by other cardiologists and that the defendant in your case should have used. In some cases, a cardiologist is an employee of a hospital. In that situation, it may be possible to hold the hospital liable for cardiology malpractice on a theory of vicarious liability. Moreover, it may also be appropriate to sue a hospital with which a cardiologist is only affiliated based on a theory of institutional negligence. Institutional negligence exists when hospital policies or procedures, rather than the acts of a particular health care professional, are to blame for a plaintiff's injuries. If you successfully establish a malpractice claim, you may recover economic (tangible) and noneconomic (intangible) compensatory damages, such as medical bills, pain and suffering, mental anguish, lost income, lost earning capacity, and out-of-pocket costs. Before 2010, there was a $500,000 cap on non-economic damages in Illinois medical malpractice lawsuits. However, the cap has been declared unconstitutional by the state Supreme Court. If you were injured or a loved one was killed because of a cardiologist’s error, our Chicago cardiology malpractice attorneys are available to help you recover the compensation you need. Most malpractice cases require significant preparation even before the lawsuit is filed, so it is best to consult us as soon as possible after you believe malpractice has occurred. At Moll Law Group, our injury lawyers represent patients and families across Cook County and in Wheaton, Naperville, and Schaumburg. Billions of dollars have been recovered in cases in which we were involved. Call us at 312-462-1700 or complete our online form to set up a free consultation.